With the announcement of significant layoffs at Turbine, I’m feeling sad at what has befallen the staff and concerned about the future of the game. Our first thoughts must be for the people who’ve lost their jobs, and are doubtless worried about what comes next. At the minimum they face a period of uncertainty and upheaval in their lives before they find their feet in new employment, maybe in new cities. I would like to think their skills will be in demand, and for sure they have great work to show on their resumes. Best of luck to all of them. I would guess that many of them are also Tolkien fans, and this was not just another job to them. I imagine it was something very special, in much the way that we know that the Lord of the Rings movies were very special to the cast and crew that worked on them. Much the same as it would have been for many of us to have the joy and privilege of making a career out of bringing Middle Earth to life. Please take the opportunity to wish him and others well at this tough time. I know that I probably underestimate how much it would mean to anyone to hear from me, being just another player and no-one they know personally. Thank you all for the well wishes and warm thoughts. They mean more than you can know. With this news the future of LOTRO is beginning to look very uncertain. There were layoffs in 2012, and now this. Before Helm’s Deep came out, it seemed that there might be a proportion of the player base that would leave because of the class changes and lack of traditional group content. Just the passage of time meant that many people who were deeply involved in the game a year or two ago have drifted away a little. I’m certainly playing less than I was. As the scope of Turbine's layoffs becomes clearer, it's harder to envision how LOTRO might accomplish even the modest goals it set for 2014. 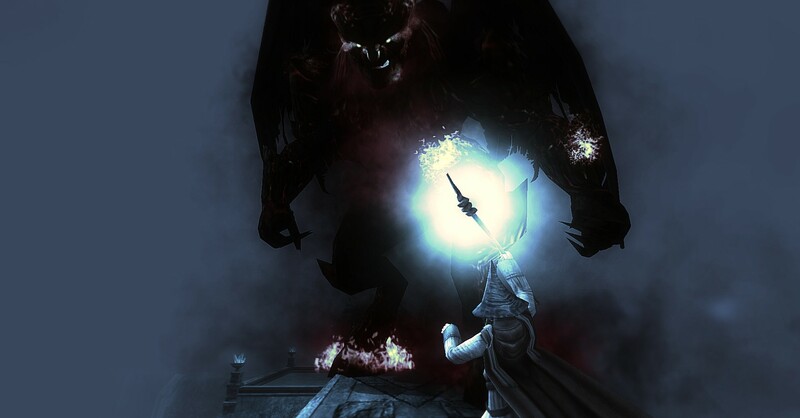 There is talk that LOTRO may be headed for maintenance mode, and even if that doesn’t seem imminent, a lot of us are wondering if we will now ever make it to Mordor and see Sauron defeated. The future we see headed towards us has a way of impinging on the present. Knowing that the holidays are around the corner or an expansion is coming in a month adds an air of excitement and energy to life now. Knowing that someone you care about has only a few months to live alters a great deal about how you see the world and how you live your life. Uncertainty is not quite the same. Nevertheless I’ve gone from taking it pretty for granted that LOTRO will around for a long long time, to feeling that the end may come sooner rather than later. The blissful assumption that things will carry on merrily into the forseeable future has gone. Assuming that doesn’t happen – and hopefully it still might – how will this uncertainty alter how we feel and act in LOTRO now? Many people I would guess will start preparing their exit strategy, maybe even leaving right away. I’m glad that I already have my foothold in The Secret World and other games for example. I don’t want to wake up one day and find LOTRO a ghost town or to hear its termination announced and have no place else ready to go. Other people will want to get the maximum out of LOTRO while there is still plenty of life there. Run those instances one more time while people are still doing them. Catch up with those kinnies while we still can. Go gaze at those amazing views, and grab screenshots. The best thing about LOTRO is the community. Yet online communities have short lives; they feel like home and we love them, and then suddenly they’re on the way out, and the end can be quick. That’s a theme in Tolkien too, and one that helps gives the Lord of the Rings its great power. The world as we’ve known it and loved it will pass away. If we’re lucky it may not be for many years yet. Perhaps like the Rohirrim we should shake our spears and ride. Ride for ruin, and the world’s ending. This entry was posted in LOTRO and tagged business, community, featured, games, mmo, tolkien. Bookmark the permalink. I’ve played Rift and it’s fun when I’m in but I don’t feel the pull to keep logging in. Plus, the soul system confuses me greatly. I’m a little excited for Wildstar again but … I don’t have a back up MMO. Hoping I won’t need one for a long time but it’s hard not to speculate. Very thoughtful post, well written! I dipped a toe in Rift also, but not much more. The sad thing is even if we all find new games, the community will still be splintered because we’ll end up in different games. And to be honest, no other world can have quite the magic of Middle Earth, or the feeling of being home. I adored LOTR from when I was a teenager, and The Hobbit even before that! Hopefully the need won’t arise, but I’m glad I’m covering my bases a little. I played Toontown for years with a group of friends (all adults!) and when we decided to move on we splintered. We decided as a group to move on, just couldn’t all agree on a game. I went to LotRO. And you’re right, I think that’s my biggest problem with GW2 and Rift … they aren’t Middle Earth. I do not think that the lay offs had anything to do with LOTRO. Turbine haas a new game that is coming out soon, and many companies have layoffs after the hardest work in a new game is finished to save money. I guess we’ll see. But some senior LOTRO devs were certainly among the people laid off. The problem that LOTRO faces is Moore’s Law. The improvements in hardware and in gaming development, from graphics to mechanics and design is on a furious pace. There are now a number of new releases every 2 years which are improved over the previous games released. LOTRO is dated. Compare playing LOTRO to playing the recently released ESO…its like driving a 1995 Mercedes (still a nice car) compared to a 2015 model. In my opinion, there is a time coming when “Brands” like LOTRO, WOW, SWTOR (intellectual properties that have long term value in their story, will need to be “re-released” as the same model but a brand new design about every 4-6 years, similar to the same cycle in the automotive industry which also advances at a furious rate) If I owned a “gaming company” like Turbine, what I would be doing is scooping up the Intellectual property titles and locking them down, then developing a studio that can manage them just like an auto company manages its model line. I would love to be able to go out tomorrow and buy a brand new 2014 LOTRO! I’d hate to car shop with you. It’s a console game. More dysfunctional now than it was in Beta. Poorly designed, with shoddy servers, unresponsive abilities, broken classes, and more bugs than a bait shop. It’s losing subscriptions faster than I can type this reply. Is there still a stigma to gaming?